In short, Holiday Inn (the hotel chain) is in the process of applying for planning permission to build a 4 storey, 90 bedroom hotel on the site. Why is this positive? Ok, lets start with the negative and work forwards. The downside of this is that the existing building will have to go. I am not happy to see local history wiped away; something that utilised the existing building may have been more welcome. And regular readers will remember that there was a serious proposal mooted a couple of years ago to turn the building into an Ismaili Community Centre. The Ismailis seemed like a very decent group, especially in the way they engaged with the community. Worcester Park's eternal problem however stepped in to sour the prospect - the additional traffic and parking issues that would occur if a large number of cars arrived in a short space of time spurred local people on to support a petition calling for the development not to go ahead. The Ismaili community, true to their honour, decided, having listened to the community, not to pursue such a proposal in an area where they felt it weren't wanted. I could see both sides of the situation and think the Ismailis made the right decision. I even stated two and half years ago that I felt a hotel would make the best use of the site. There are possibly many potential uses of the building and/or the site however the range economically viable possibilities is most likely rather small and probably consist of flats, some extremely clever new retail idea or a hotel. Directly across the road from the site is the X26 bus stop, with buses straight from and to Heathrow airport. Immediately behind this bus stop is Worcester Park railway station with trains direct to Waterloo (and when Crossrail comes through - trains to Victoria and other parts of Central London too). This makes this spot very attractive to anyone flying in to do business in London. A hotel at this site could be a very successful business for that reason alone. And while there will be parking for numerous cars underneath the hotel, the likelihood is that many guests will arrive on the bus or train (being most convenient for business travellers) and most will not be arriving all at the same time anyway, even if they do bring their cars - so the traffic / parking issue with this development is minimal. I am keeping an eye on the Kingston Council planning website and look forward to seeing the actual planning proposal when it is submitted. I will be hoping of course that the design of the new hotel is sympathetic to the area and not just a nasty steel, glass and concrete block. 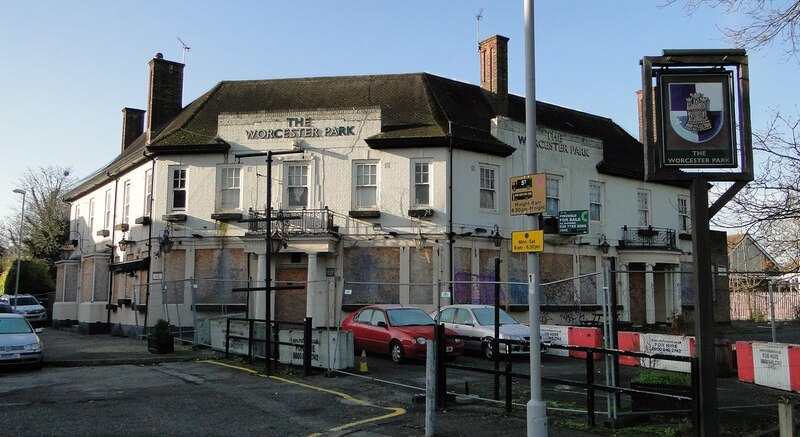 (I will have words to say if this is the case...) However, with this caveat, given all the things this site could be, I feel this once, Worcester Park is getting the right end of the stick and might be the the economic kick start the area has been looking for for a while.